Lebanon’s Cardinal Bechara Boutros ar-Ra'i has been itching for nearly two years to become the first Maronite patriarch to visit Syria since Lebanon’s independence in 1943. He did it this weekend. Syria’s ambassador in Beirut, Ali Abdulkarim Ali, officially invited Ra’i to visit Syria in the week he was elected the 77th patriarch of Lebanon’s Maronites on the day the Syrian uprising broke out in mid-March 2011. Ra’i, who has since been appointed cardinal by Pope Benedict XVI, entered Syria yesterday through the Masnaa border crossing. He arrived in Damascus amid tight security measures to attend a ceremony marking the enthronement of the new patriarch of the Greek Orthodox Church. He held a mass at the Maronite Cathedral of St. Anthony in the Bab Touma district of the Syrian capital soon after arriving in the war-ravaged country. Representing President Bashar al-Assad, Joseph Suweid, a Christian minister of state belonging to the Syrian Social Nationalist Party (SSNP), welcomed him with open arms and a warm embrace in the cathedral’s entrance hall. Although his aides said there was no political dimension to the visit, Ra’i told the congregation in a short sermon preceding the mass, “We pray each day for the birth of a new society and a new state fulfilling all our good people’s hopes. “From here in Damascus, we join you in telling all those engaging in these tragedies: enough warfare, violence, killings and destruction of homes and landmarks. This Sunday morning, Ra’i attended the enthronement of Syria's Greek Orthodox leader, Yuhanna X Yazigi, at the Church of the Holy Cross in Qassaa, a central Damascus neighborhood. Yazigi, bishop of Western and Central Europe, was elected Greek Orthodox patriarch of the Levant and Antioch, succeeding Patriarch Hazim Ignatius IV who died in December 2012. Lebanese Maronites allied with Shiite militant group Hezbollah, which is supported by Syria and Iran, are hailing the trip by Ra’i to Syria as a shield for Christians. Other Lebanese Maronite Christians, allied with former premier Saad Hariri, have expressed their misgivings. “Here is Patriarch Ra’i in Assad’s Syria, the Syria of a child-killer regime, revealing his true colors under the pretext of participating in the enthronement of Greek Orthodox Patriarch Yuhanna X Yazigi. The pretext does not in any way hide the fact that he empathizes with Assad’s course of action,” Elias Bejjani writes in a commentary for Cedar News. He also indirectly defended Hezbollah’s arms by linking the party’s arsenal to Israel’s exit from Lebanon’s Shebaa Farms and the repatriation of Palestinian refugees. Two months later, he defended Hezbollah suspects who were indicted in the assassination of former Prime Minister Rafik Hariri by the UN-backed Special Tribunal for Lebanon (STL). Three weeks ago, he said in his Sunday sermon at the seat of the Maronite patriarchate in Bkerke that Lebanon should lobby the international community to offload its Syrian refugees into “safe areas” in Syria and other Arab countries. In his book, Le Tsunami Arabe, Franco-Lebanese author Antoine Basbous suggests Ra’i’s public endorsement of the Assad regime is a likely result of the patriarch being blackmailed by Damascus (see “The Ra’i rumor tells us little”). In the other Syrian corner sits another Christian, this one a native Syrian born to a Christian family in the city of Qatana in Rif Dimashq Governorate. 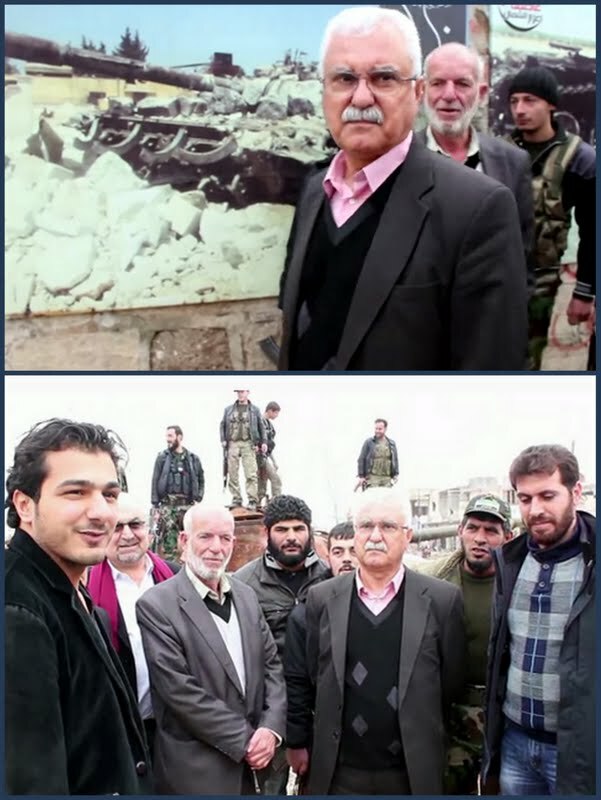 He is George Sabra, head of the Syrian National Council and second-in-command of the Syrian National Coalition of Revolutionary and Opposition Forces (see my post, “Syrian opposition elects Christian leader”). While Damascus was welcoming Ra’i, Sabra was concluding the first tour by a Syrian National Coalition leader of areas in Aleppo and Idlib governorates held by the Free Syrian Army (FSA). A short video posted by activists on YouTube showed scrutinizing photo murals of the uprising in the small town of Azaz close to Aleppo after coming through the opposition-held Bab al-Hawa international border crossing between Turkey and Syria.